Maybe the DVD business isn’t dead — for vampire movies. 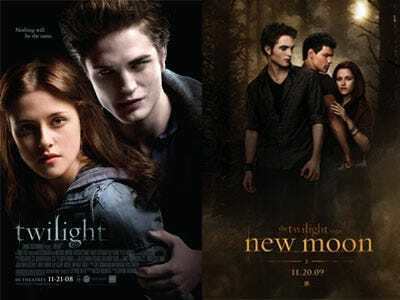 The Twilight Saga: New Moon sold more than 4 million DVDs when it hit shelves this weekend. The initial sales indicate that the second instalment of the book-to-film saga could outsell the first, according to a release from the movie’s studio. Twilight, which sold 3.8 million DVDs its opening weekend, went on to become the No. 1 selling DVD in 2009. 9.2 million copies of the film were sold. That’s good news for Summit Entertainment, the independent studio distributing the movie. We got the news from their release, via Deadline.com. Since peaking at $24.1 billion in 2006, overall DVD sales have been steadily declining. The popularity and ease of online streaming and rental services like Netflix and Redbox have demolished industry-wide sales. “New Moon” has grossed more than $705 million worldwide since it opened in theatres in November last year. The third film, The Twilight Saga: Eclipse hits theatres June 30.